With the warm summer days creeping in, I couldn't help but think of white. Just makes me feel cool. 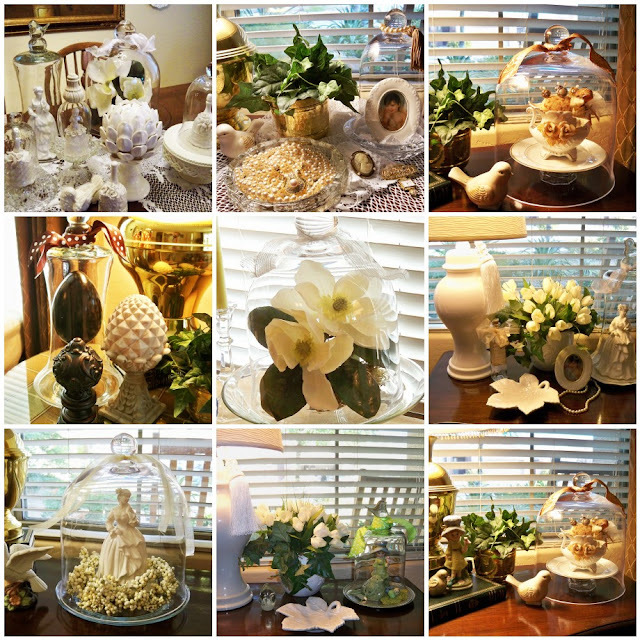 Just some pictures of previous cloche displays. I am joining Mosaic Monday @ Little Red House. Stop in and say hello to Mary and enjoy all of the wonderful mosaics everyone creates. See you later this afternoon for Table Top Tuesday. I really look forward to your visits. Each of these photos is such a pretty vignette all by itself, Marty! Just gorgeous all together. A great way to start off the week. I love all your cloches. Every time I look at mine I think...Marty. Beautiful pictures of well-formulated into a whole - retro style. You are right, white is so cool, Marty! I love your mosaic and your examples of white. Your whites are just beautiful, Marty. Love the mosaic. Marty, your white mosaic for summer is absolutely beautiful and I love your new blog header. I agree, a touch of white is wonderufl for summer. I can't do the whole all white thing, I crave color too much. But, a little here and there is so nice. Your mosaic is so pretty. Oh, I have been meaning to ask, are you going to have a Summer Cloche party? Just curious. Have a wonderful day Marty! I will be back to link to TTT. I really enjoy visiting your blog. You always give the best ideas. I'm going to steal one today! Your mosaic is stunning ... as always. I love cloches (sp?) ... are the also called belljars?